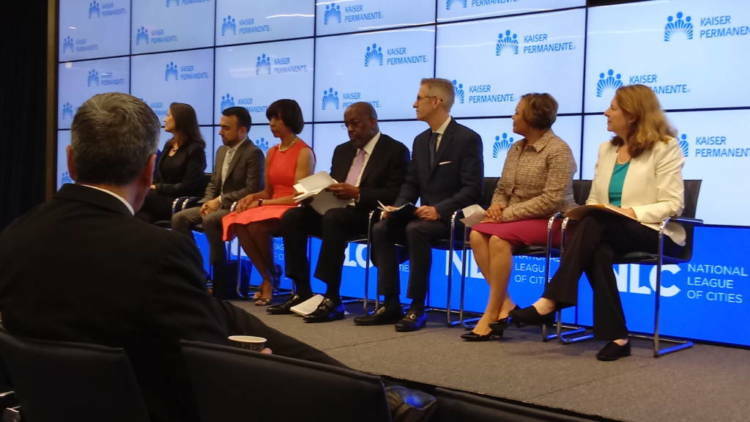 The Mayors and CEOs for U.S. Housing Investment held a press conference May 18 in the nation’s capital to discuss progress made since the campaign was announced in January. In the face of federal divestment and growing wealth inequality, American cities are on the front lines of the nation’s largest challenges, according to Portland Mayor Ted Wheeler, who kicked off the event. The most daunting challenge, by far, is housing affordability. Wheeler’s city needs 23,000 more units of affordable housing than it has to meet needs of constituents. He said the dearth of housing options would negatively affect his community’s health. Kaiser Permanente CEO Bernard Tyson agreed, calling stable housing an essential part of healthcare and well-being for the mind, body and spirit. 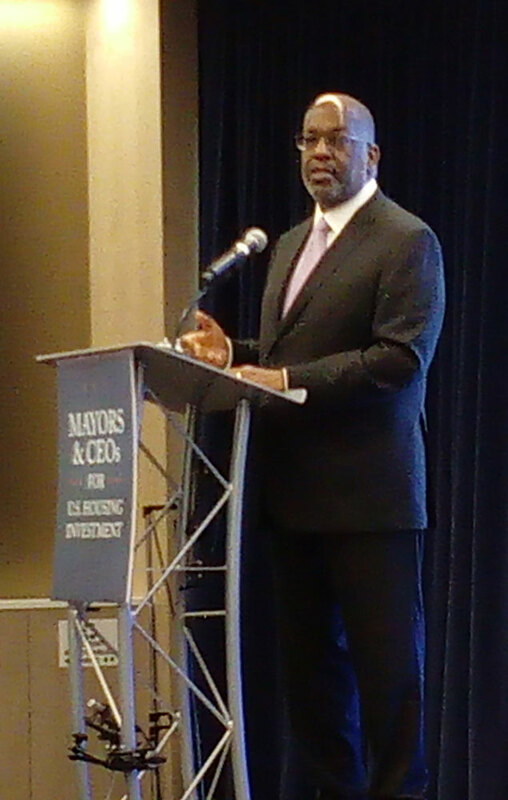 At the press conference, Kaiser Permanente announced it would join the Mayors & CEOs coalition and invest $200 million to be focused on preventing low-income people from falling into homelessness and providing supportive services. Tyson also hoped the substantial investment would set an example for other businesses to get involved. But as the cost of housing continues to rise, so does the number of people living on the streets. National data analyzed in 2017 showed that the number of people experiencing homelessness had risen for the first time in seven years. “We have taken matters into our own hands despite federal restrictions in support,” Wheeler said of the Mayors and CEOs campaign. He said housing support through the U.S. Department of Housing and Urban Development has declined by 80 percent since 1980. Wheeler lauded Kaiser, as well as Columbia Sportswear, based in Portland. The latter’s CEO personally contributed $1.5 million to address local homelessness and encouraged fellow business leaders there to do the same. “Government alone cannot solve this withering crisis,” Wheeler said. Oakland, California, has experienced similar economic growth; as housing prices rise, 40 percent more people are experiencing homelessness. The average medium-sized house sells for just under $1 million. Schaaf described motorists headed downtown being greeted by a tent city that spawls blocks in every direction. More than 100 unsheltered residents live along the off-ramps. The city and surrounding county both passed housing bonds in the previous election. Oakland has also been identifying vacant lots near existing homeless encampments and establishing small villages of “Tuff Shed”-brand structures, each with a lock, electricity, insulation and double-paned windows. The sheds provide more safety and security than a tent and, unlike shelters, allow people to bring in pets, possessions and partners.The city also provides sanitation and other services on site. The mayors of Baltimore and Alexandria, Virginia, were also present. Alexandria Mayor Allison Silberberg outlined several creative solutions being explored in her city. In one case, a shelter and an affordable housing developer, both nonprofits, have joined forces to redevelop the city’s centrally located shelter in Old Town. The new facility will remain a shelter on the ground floor and have 140 units of affordable housing on top. Ten of those units are planned to be deeply affordable permanent supportive housing units to help people who are ready to transition from the shelter into affordable housing. “These are creative solutions, and they are possible with public, private and nonprofit partnerships,” Silberberg said. The new shelter is funded by tax credits, city funds and private financing, including $1.6 million in state and national trust-fund dollars. During construction, the shelter will continue to operate in an interim space, an old Macy’s store, donated by the Howard Hughes development company. When asked whether the money would be used for pubic housing, Kaiser Permanente and other members of the private sector expressed interest in looking beyond simply investing in the development of local affordable housing to address the systemic nature of homelessness. This article has been updated to reflect that Kaiser Permanente made two separate announcements: that it was joining the Mayor and CEOs campaign and that the company was investing $200 million dollars in preventing homelessness and serving homeless people. We initially reported that the $200 million investment was made as part of of the Mayors and CEOs campaign.